The Southern Region weed science championship team includes Wyatt Coffman, Zachary Lancaster, Lawson Priess, Jacob Richburg and Hannah Wright with coaches and professors Nilda Burgos and Jason Norsworthy. All are students in Bumpers College's Department of Crop, Soil, and Environmental Sciences. The team also won the Green Alligator Award for a perfect score in team sprayer calibration. FAYETTEVILLE, Ark. 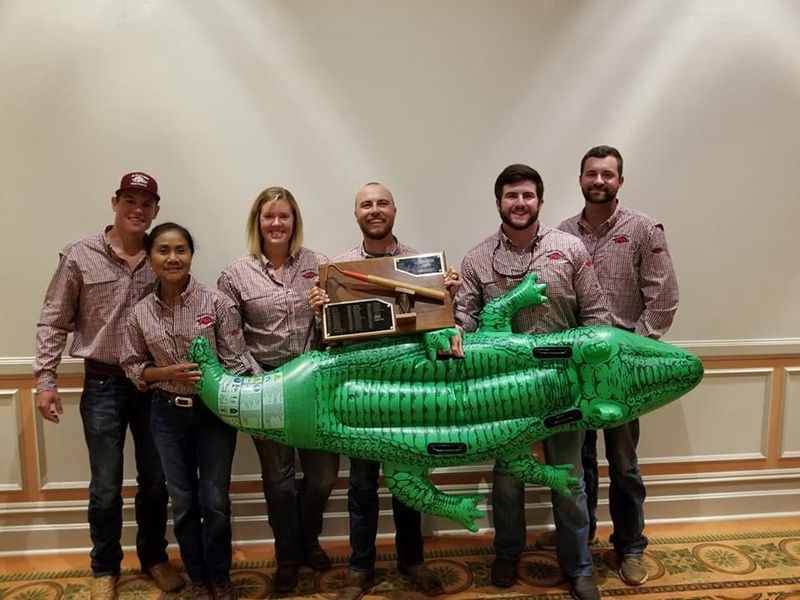 – The U of A weed science team won the Southern Weed Science Society 2018 Southern Weed Contest in August at the Agricenter International in Memphis, Tennessee. Competitors rotated to different stations where various weed science-related scenarios were set up. From herbicide symptomology and calibration, to weed identification and crop/weed situation recommendations, students were challenged, tested and scored. To provide a diversion from their chosen discipline, a "mystery event" was included in this year's contest. A flat-bed gooseneck trailer was set up with various flaws, including items such as a cargo load not being properly loaded or secured for transport. Students were expected to identify faults making it illegal for the trailer to travel. The U of A's team is composed of students from the Dale Bumpers College of Agricultural, Food and Life Science's Department of Crop, Soil, and Environmental Sciences. Team members are Wyatt Coffman, Zachary Lancaster, Lawson Priess, Jacob Richburg and Hannah Wright. CSES professors Nilda Burgos and Jason Norsworthy are the coaches. Individually, Lancaster, the team captain, was first overall, and the top individual in weed identification and calibration. Wright was fourth overall and first in the farmer problem category. Coffman was third overall, Priess fifth and Richburg eighth. The University of Arkansas was first, followed by Virginia Tech University and Louisiana State University. In addition, U of A's team earned the Green Alligator Award for recording a perfect score in the team sprayer calibration event. The challenge involved calibrating a fluoridone application in a pond to control aquatic weeds.